Ashevak Adla was born on February 22nd, 1977 in Iqaluit and returned home to Cape Dorset. Adla comes from a family of carvers. His maternal grandfather Aoudla (Audla) Pee is well known for revealing the spiritual qualities of bears through his carvings of stone. His grandmother, Nurluapik Pee was a sculptor and craftswoman. His paternal grandfather Kalai Adla and his wife Tai carved stone and did drawings. His cousin Tim Pee is also a carver. A young Ashevak would watch his grandfather Aoudla Pee carve Arctic creatures out of stone. When Adla was eleven or twelve years old, he started working with carving tools. His first carvings were simple sculptures and his first piece was a beluga. He started carving because he wanted to provide an income for himself. His knowledge of the art form came from observing respected artists and carving his own pieces. As a teenager, Ashevak learned many techniques by watching master carver Kiugak (Kiuwak) Ashoona work on a number of occasions. He also spent time watching Nuna Parr carve his bears. He admired Kiugak’s human figures because of how detailed and realistic Kiugak was able to render his carvings. When asked what his biggest inspiration to continue carving is, Ashevak replied that his children are his motivation. Ashevak’s spouse is Qilimiumi Ningeosiak and they have 4 children together. He has sculpted birds, human figures and transformations but has focused mainly on making bears because they are in high demand. He uses electric tools because it is less time consuming. His detailed bear carvings can be walking, stalking or sniffing, as they seek out Arctic sustenance. He also carves dancing bears with distinguished features and poise. Ashevak has developed his own signature style and his bears are admired by many. Ashevak often finishes his subjects with a high polish to showcase the beauty of the serpentine stone. 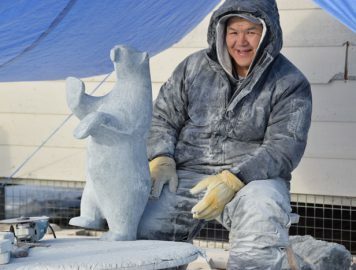 Ashevak has always lived and carved in Cape Dorset. Some of Ashevak’s hobbies include spending time with friends and family, camping and hunting. Spring time is his favorite season to go out on the land. When asked what he likes about hunting the most, Ashevak replied with “everything”, ranging from seals, geese, ptarmigan and walrus in the fall. His grandparents Kalai and Tai taught him how to hunt when he was a child. Now, Ashevak goes hunting with his brother Ettula, his cousins and other friends. He proudly told how his daughter Laisa caught her first fish this past spring in 2016. Adla’s work has been available in national and international galleries for over two decades. One of his carvings is on the cover of the book Cape Dorset Sculpture which was published in 2005. Ashevak Adla’s carvings are some of the most sought after sculptures of the younger generation of Inuit artists.